If you did not see the Joplin Extreme Makeover edition of Extreme Makeover Home Edition - be sure to visit their WEBSITE. I am a top Realtor in Northwest Arkansas and when these tornadoes hit in Joplin, which is so close to home, our community was extremely saddened by Joplin's loss. In fact, many in our Northwest Arkansas community went to help out our neighbors in need. I was so excited when I heard that Extreme Makeover Home Edition was going to help families re-build their homes and their lives. I watched the show last week and I have to say I had tears in my eyes. What an amazing show! Here are pictures of the finished homes. 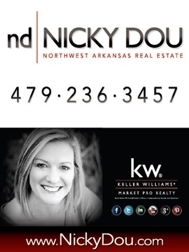 Since Extreme Makeover Joplin aired on TV, I have been asked by Northwest Arkansas buyers where they could find homes built in NWA, similar to those that the wonderful builders of the Joplin's "Seven in Seven Days". Well - crazy enough I happen to represent a community in Fayetteville, AR where the homes very similar to those I saw in the show. A big thanks to the Extreme Makeover Home Edition for helping out so many families in Joplin and across the United States! What a blessing you have been to so many.